#Goldfinger Sean’s stealth jumpsuit is awfully shiny. That lady with with the spinning licence plates for teeth! Man, I bet she made Jaws feel insecure. #Goldfinger #TSWLM. Bond “listening to Beatles w/o earmuffs” is funny because Bassey’s #Goldfinger title track was produced by Beatles producer George Martin. @007hertzrumble And to let young men fantasies for um….later. Producers had to pay for the Aston Martin. But after the success of #Goldfinger, they never had to spend money on a car again. I appreciate that not only are #Goldfinger‘s goons all wearing the same colored pajamas, but also matching sashes and utility belts. @MentorsCamper I think #thunderball, while a weaker film, has the best Barry score. @krissy_myers Yeah. The producers deemed it too “suggestive” apparently. Why it wasn’t deemed “stupid” is another question entirely. @Mr_Fantastic86 Suit choice for the wedding is inspired by Bond’s suit in this part of #Goldfinger. Minus high pants. Whoever wrote Die Hard With A Vengeance didn’t watch this “math” scene in #Goldfinger. 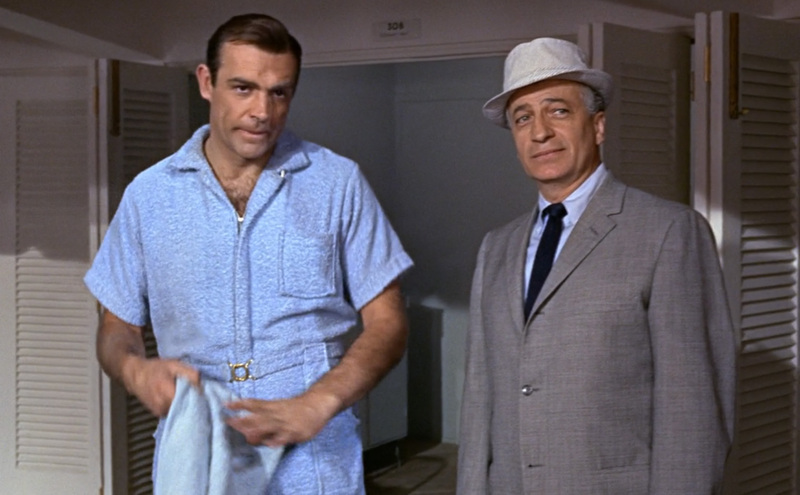 Y’know… not to knock Connery, Frobe et al, but Fort Knox just might be my favorite character in #Goldfinger. #Goldfinger ‘s atomic bomb looks like it’s being housed in a space-age hot dog vendor’s cart. …okay, just a couple more rapey comments…. #Goldfinger won first Academy Award for a Bond movie. Norman Wanstall won for Best Sound Effects. #TBall later won for visual effects. 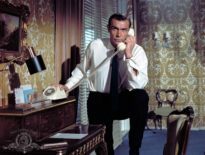 In the original cut of #Goldfinger, timer stopped at 003, explaining Bond’s line about “three more clicks.” It was later changed to 007. @echidnabot I borrowed my brother’s GI Joes to rescue Barbie when her car went over a cliff into a lake. Sadly, she drowned all the time.